All the best drone information on the web. Drones, UAVs, Quadcopters, and more. 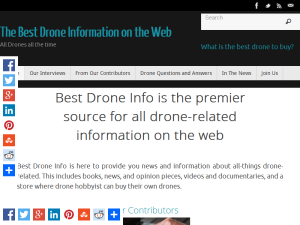 This what your The Best Drone Info Blog Ad will look like to visitors! Of course you will want to use keywords and ad targeting to get the most out of your ad campaign! So purchase an ad space today before there all gone! If Amazon follows through on a pair of patent applications, future fulfillment centers could be transported on their rounds by trains, ships or trucks and deliver their goods with autonomous drones flying out from the tops of shipping containers. The on-demand system for package delivery is covered in two applications that were filed a year and a half ago but published just today. The inventors are principal software engineer Brian Beckman and intermodal program manager Nicholas Bjone. Their concept calls for putting all the hardware for a fulfillment center, including a robotic arm and a squadron of drones, inside shipping containers (also known as intermodal vehicles). The standard-size containers are designed to be easily transferred from ships to trains to tractor-trailer trucks. Goods destined for delivery could be loaded into shelves inside the containers, moved around using the robotic arm, and loaded onto drones when customer orders are passed along via wireless connections. Lids on the tops of the containers would open to dispatch package-laden drones. The system’s advantage has to do with the ability to send out fulfillment centers that are laden with goods via a wide range of shipping routes in response to anticipated demand. “The areas where the demand is known or anticipated may be identified on any basis, including but not limited to past histories of purchases or deliveries to such areas, or events that are scheduled to occur in such areas,” the inventors write. The post Fulfillment Centers to Ride Rails and Dispatch Amazon Delivery Drones appeared first on . The Defense Advanced Research Projects Agency has overseen trials using mind-controlled drones for use by the military. According to The Daily Beast, these trials were computer simulations that are the precursor to what could lead to robotics that are controlled by the mind of a human operator. The Military Times asked DARPA for comment regarding the experiment. An email from a spokesman from DARPA was able to shed light on the experiment, seemingly fit for science fiction. During this discussion DARPA announced that a volunteer had flown a simulated F-35. So far, both volunteers of the tests live with a degree of paralysis. According to DARPA, each individual had to undergo surgery to place electrodes in their brain to successfully complete a neural interface. However, DARPA has plans to be able to create the interface without the surgery. The post The Pentagon wants to win future wars with mind-controlled drones appeared first on . Competition Crew: Pilots can’t race on their own. The crew of people involved in a competition includes Spotters, Judges and Starters. A Spotter stands behind a pilot and acts as their eyes outside the goggles. Pilots don’t have a rear-view mirror, so they have an important role. Judges – there is one per pilot – checks the video feed of the pilot. If a pilot misses a gate the judge calls out the pilot’s number and they have to go around again. The Starter has a safety role and runs the race. The post All of the Gear a Drone-racing Pilot Needs appeared first on . Birds have long inspired humans to create their own ways to fly. We know that soaring bird species that migrate long distances use thermal updrafts to stay in the air without using up energy flapping their wings. And glider pilots similarly use thermals currents and other areas of rising air in order to remain airborne for longer. Yet, while we’ve mastered gliding through these updrafts using various instruments, the exact mechanisms that allow birds to soar are still unknown. But a team of researchers from California and Italy have made some telling steps towards answering this question using artificial intelligence (AI). And it could lead to new developments in navigation systems for aircraft, with particular implications for creating drones that can stay airborne for very long periods of time. The aim of the study, published in Nature, was to train a small two-metre wingspan autonomous glider to fly in thermals, just like a real bird would. The glider was programmed with a kind of AI known as machine learning that enabled it to work out how to use the air currents to stay in the air for longer. Machine learning is an alternative approach to programming a computer to do a complex task. Rather than feeding a computer (or autonomous glider in this case) a set of instructions telling it how to do something, you tell the computer how you would like it to respond and reward it when it does the right thing. Over time it will learn what things are rewarded and will tend to do these behaviours instead. This technique is how computer programs such as Google’s AlphaGo can learn to play the board game Go and then beat professional players, a feat simply not possible with conventional programming techniques. The post NEW Drone AI Could Give UAVs the Ability to Ride Air Currents Like Birds appeared first on . A U.S. Reaper drone shot down another with a missile, the Air Force revealed yesterday. The incident, which took place last year and involved an unmanned target drone, was the first case of a drone shooting down another another aircraft. The event ism a watershed moment in the history of aerial warfare, as unmanned aircraft begin to muscle in on air-to-air combat—previously the exclusive domain of manned aircraft. Colonel Julian Cheater, commander of the 432nd Air Expeditionary Wing, revealed the incident in an interview with Military.com. The 432nd “Hunters” Wing is based at Creech Air Force Base, Nevada and is responsible for “unmanned precision attack and intelligence, surveillance, and reconnaissance missions…in support of overseas contingency operations”. According to Military.com, a MQ-9 Reaper launched a infrared guided air-to-air missile against a “maneuvering target,” a smaller target drone. The missile scored a direct hit. The Air Force regularly shoots down target drones, but this is the first time an unmanned aircraft has shot down another aircraft. The MQ-9 Reaper is a bigger, more heavily armed version of the original MQ-1 Predator drone. The Reaper can typically carry four AGM-114 Hellfire air-to-ground missiles and two 500-pound laser or GPS-guided bombs. U.S. military use of unmanned drones exploded in the post-9/11 era, with the uncrewed craft taking on reconnaissance and later precision ground attack missions. Although expanding their mission into the world of air-to-air combat was inevitable and faced no serious technical challenges, it took a while for a drone to shoot down another aircraft. The post A Reaper Drone Shot Down Another Drone in First Unmanned Air-to-Air Kill appeared first on . A breakneck innovation culture, a geographic profile that demands new logistics thinking and government backing have made China a drones powerhouse. Since its inception, American and European leadership has defined the aviation world. The West’s role as the international leader for aviation has been largely uncontested; Boeing and Airbus’s duopoly in passenger aircraft manufacturing and the Federal Aviation Administration (FAA) and European Aviation Safety Agency’s (EASA) regulatory leadership set the standard for aviation safety across the globe. Forecasts indicate clearly that China is set to become a leading force and disrupt the world of aviation. The drone industry is characterized and driven by one company: Da-Jiang Innovations (DJI). DJI has over 70% of the global market share for the consumer drone industry, with revenue of $2.7 billion in 2017. No Western-based company is able to compete with the complete supply chain integration, manufacturing pipeline, innovative pace and logistics support that defines the Shenzhen-based company. This provides immense and clear competitive advantages. Time and time again, international competitors have failed to compete with the low cost of hardware and software design, manufacturing and logistics chain that define the broader Chinese economy. DJI innovates quicker than any other drone company and integrates their competitor’s capabilities quickly, while also developing capabilities needed for safe flight faster than most; enabling better aerial data acquisition, video sharing and user experience. Beyond implementing aerial imagery, Chinese manufacturers are well ahead of their competitors in the development and testing of autonomous systems for personal mobility. Ehang, a Chinese company focusing on passenger transport without onboard control, completed its first human test flights in rural China in early 2018; boasting speeds of up to 130km/h and a maximum distance of 80 miles. The post 3 Reasons Why China is The Global Drones Leader appeared first on . If you are the owner of The Best Drone Info, or someone who enjoys this blog why not upgrade it to a Featured Listing or Permanent Listing?